Home of the Buffalo Hunters "Hall of Fame"
In Alaska, Mountain Goats occur through the Southeastern Panhandle and continue north and west along the coastal mountains to Cook Inlet. In South-central Alaska they are generally confined to the Chugach and Wrangell mountains. Goats also have been transplanted to Kodiak Island where they have established a huntable population. I had tried for 6 years to fill a Mountain Goat tag with no luck at all, in spite of my many hard efforts. 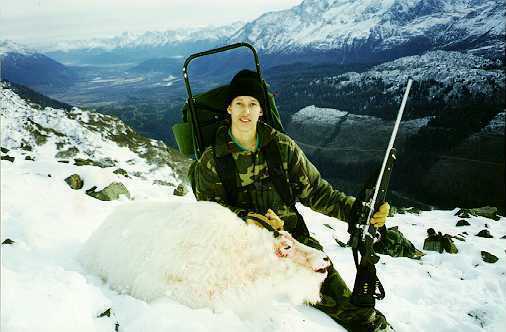 A Buffalo hunter , soon to be friend, who stayed with us at the Silver Fox Roadhouse invited us down to Haines. The following year I gave Don Nash a call and he said he would start looking for some Mountain Goats for us to get into before we arrived. Mountain Goats inhabit the rugged coast line mountains of Alaska. The ones that are newer geological formations and jagged and unforgiving for the unsure footed. There are no Mountain Goats around our area so off to Haines we went. Down the Alaska Hwy and out of Alaska into Canada. Then through Canada and back into Alaska again to reach Haines. It was a long 12 hour drive and we were beat when we reached Haines just before noon. But Don was fresh and full of his enthusiasm. He ushered us immediately out of town and took us on a jaunt down a long dirt washboard road that was being pushed in to some new area for cutting timber. At the end of the road, Don pointed down a long canyon with a roaring river at the bottom. He pointed out that we could get down the canyon o.k. but he wasn’t too sure about crossing the river. If we could get across the river, then all we had to do was climb the other side of the canyon until we cleared the timber. The Goats were right there at the top of that Mountain way over there. With a spotting scope we sure could see those small white spots against the snow that must be Goats. Don told us to hurry, so we wouldn’t miss being in the woods by dark. Charley and I took off fighting head high devils club (a very thorny infectious club like growth) and thick alders all the way to the river. We forded the ice cold turbulent river which was only waist deep, and tugged at our packs. Then started our climb up the next 2000 feet of more devils club and alders; one ridge after another, until we reached the edge of the woods just as darkness over took us. We melted snow by firelight and strained out the pine needles and dirt with a piece of game bag. Exhausted, but full from eating our MRE’s, we passed out under the stars and a low hanging spruce bow which was the extent of our tent. The second day we climbed another 2000 feet up through snow bowed alders and thick brush. Eventually we reached the snow capped peaks. No vegetation to fight here. Just some liken and mosses that had been blown free of snow. Apparently the goats really like it here. We started seeing them each way we looked. And they were seeing us. We spooked a couple nice Billy’s above us. We continued going higher, all the way to the very top. No goats there, so we picked another route and worked our way back down. We came down to an overhang and there was a good looking goat below us, looking down towards our camp. We eased up to a good shooting spot and Charley settled in for his shot. First though, he had to remove his rock hard leather gloves and thaw his fingers enough to feel the trigger pull. He did well. His shot dropped the goat where it lay. We watched it a while then started congratulating each other. It was a rewarding ending for all our hard effort. I had video taped the whole episode and now put the camera away. It was time to go down to the goat and get to work. Then Charley excitedly exclaimed, it’s tumbling down the mountain. Sure enough. We had watched the goat for 15 or 20 minutes and it never stirred. Then apparently it gave one of those death kicks they are famous for and away it went. Rolling, then end over end and finally plummeting over a cliff and out of sight. We gathered our wits and headed down to look for our goat. We eventually found it half way down the mountain. One horn was broken off at the skull, but still attached by skin. We were two happy goat hunters. It was a nice Nanny. A very good specimen for our planned wildlife museum. Now we have to come back and get us a Billy.